This was one of those projects that when the vision comes, you drop everything to make it because you can’t wait to see if it will work out like it is in your head. Good thing it didn’t take me too long. The baby’s was begging for attention. 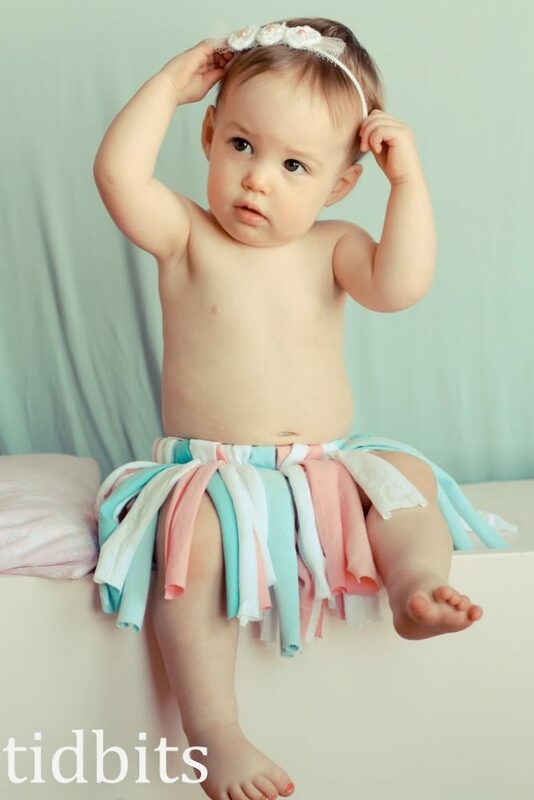 This “T-Shirt Tutu” was made entirely from old T-shirts I stashed instead of trashing. Much like my Party in the Back dress. I love the flexibility of knits. 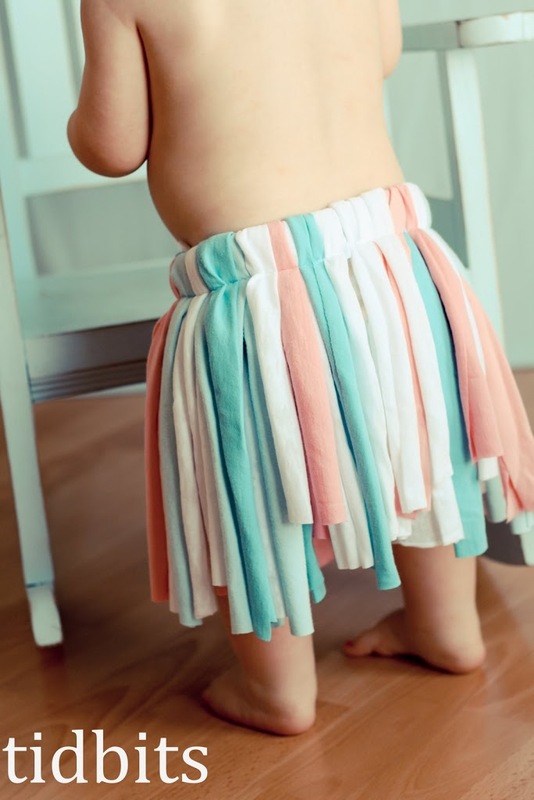 I’ve been seeing the tutu’s around blogland made from woven scraps and thought they were so cute. But I dreaded seeing what it would look like after being washed with all those raw edges. That’s when the light bulb turned on. Duh! KNITS! I do love how it turned out. 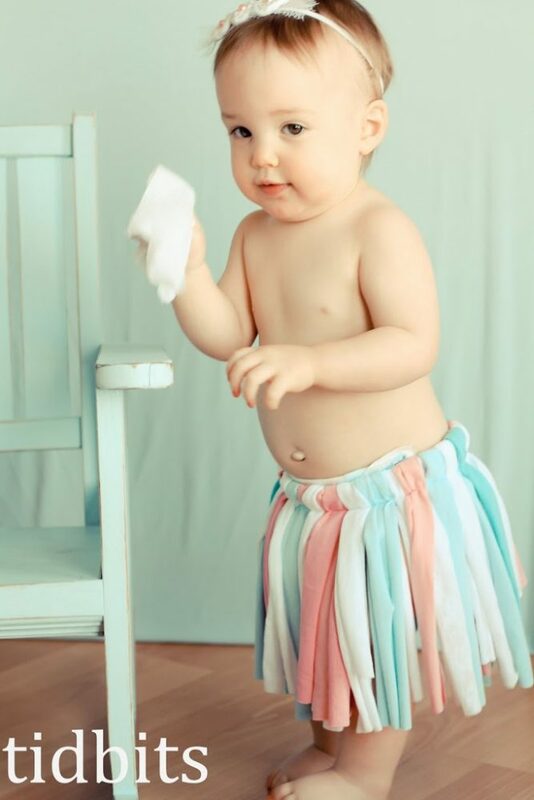 Super fun outfit for some 1 year old photo’s. If only she would keep the blasted headbands on. I am proud to tell you that I took detailed pics during the process. I good tutorial was long overdue on this blog of mine. It was very easy to make, hard to screw up, and thrifty. Great for any beginner sewer. 1. Gather any knits you have. The softer and flowey-er the better. I would save any knits you have with spandex content for another purpose. Just because those are hard to come by and great for leggings. 2. You will need a strip of elastic. Mine was 1 1/4 inch knit sports elastic – for no particular reason. It’s what I had. 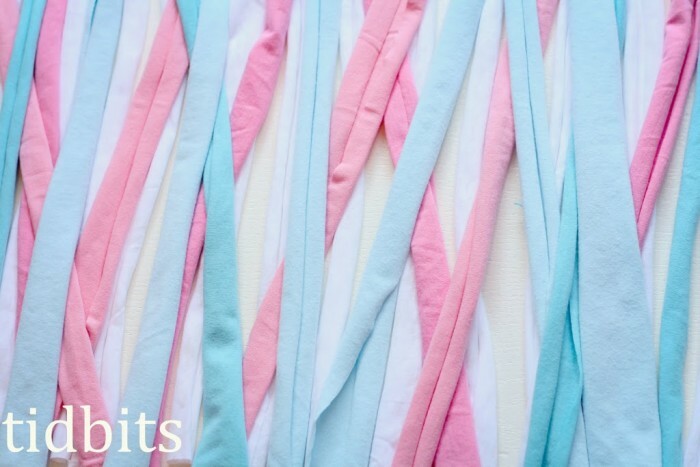 Its a super soft and gentle stretch type of elastic. I would just make sure your elastic is at least an inch thick. The length of your elastic should measure the same length around the waist you are putting it on. You will be seaming it together at the ends which will give it just enough snug for the belly. 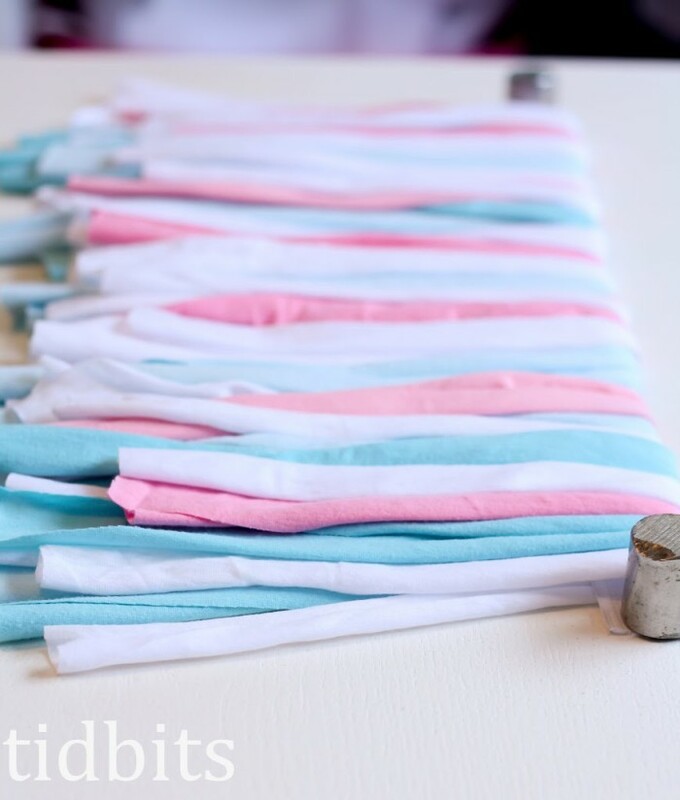 Begin by cutting strips from your T-shirts. 1. Cut the hem off and discard. 2. 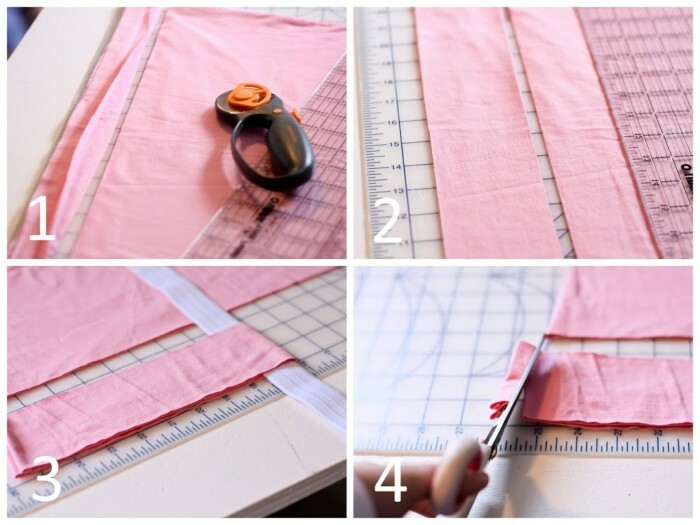 Cut 2 1/2 inch strips as wide as your shirt is. 3. 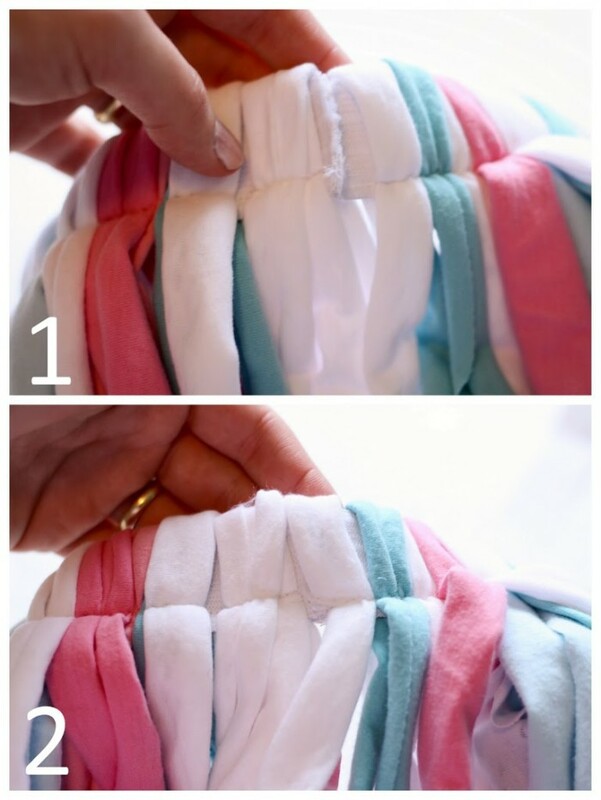 Grab your elastic and fold over your strip of knit. I did this to measure how long I wanted the strips. Keep in mind, you will be pulling on your strip to make the edges curl in, which will in turn make your strip longer. 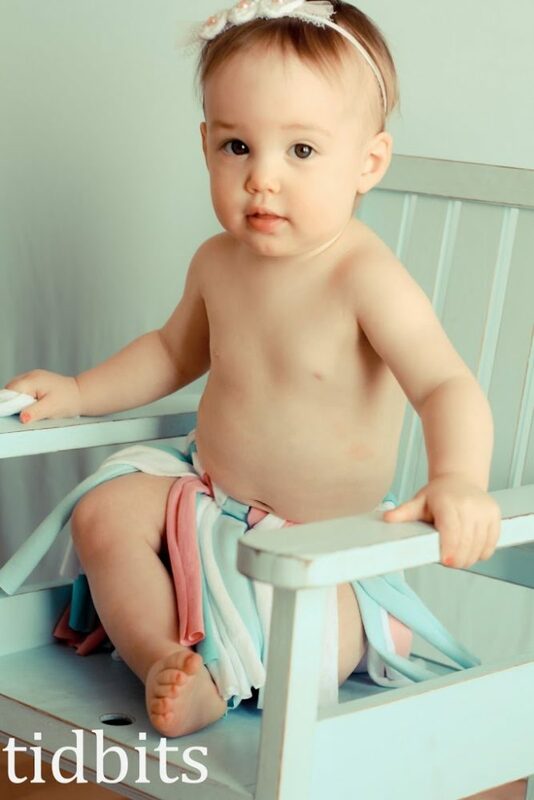 You can always trim if it’s too long – just make sure the length is going to cover your child from the waist to where you want the hem to be. 4. 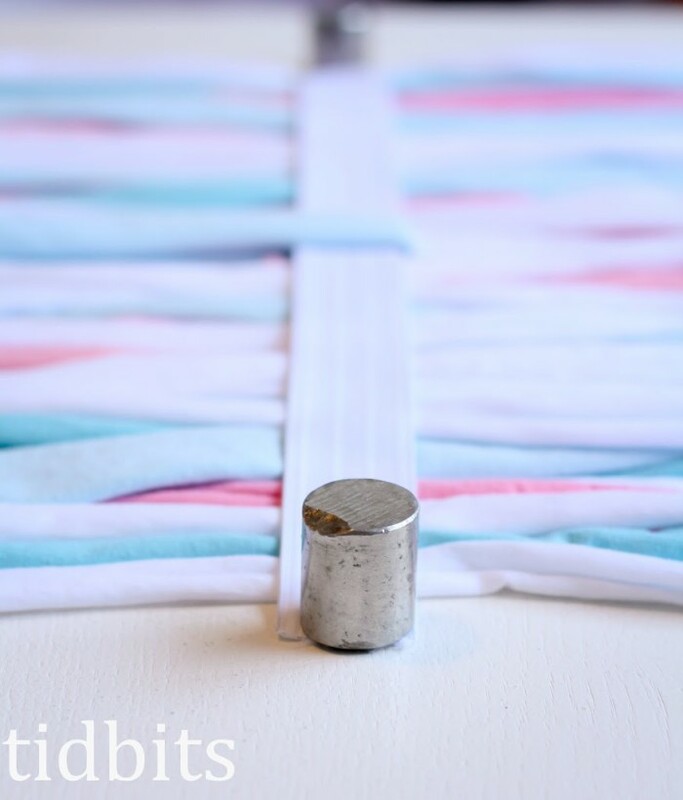 Cut off the side seams from your knit shirt. 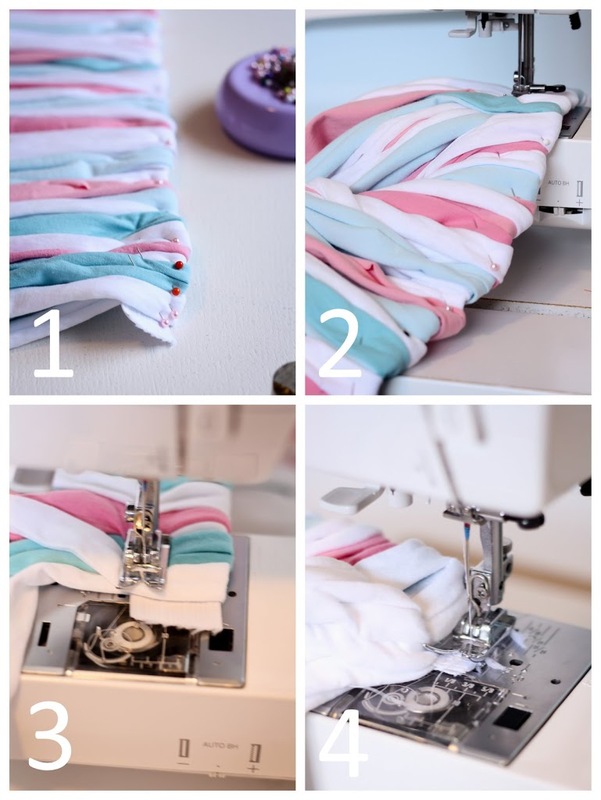 After you have done this, assuming you are using both front and back of the shirt, you will end up with 2 long strips that will be folded in half. 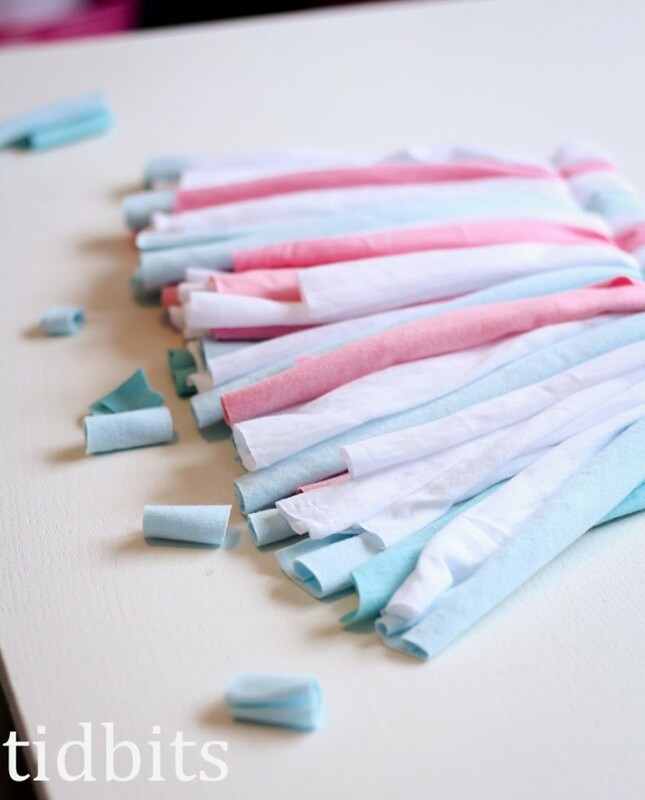 Keep cutting your strips and pulling them until you have an estimate of what you need. It’s hard to say how much you will need, but just make a good stack of them. You can always go back and cut more if you need more. 1. The next step is to lay all your strips out flat. If you’ll notice in the pictures I have my pattern weights (something my husband found at work) spaced out the width of my elastic. Then I started placing white strips in between. 2. Then I started placing the colored strips randomly and slightly criss-crossed throughout. 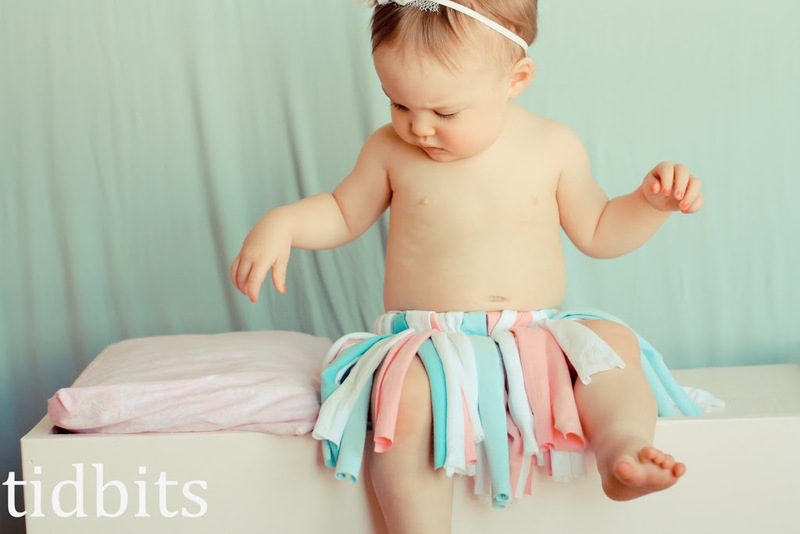 Note: Most simple tutu’s are made by tying the strips onto the elastic, making it a no-sew project. 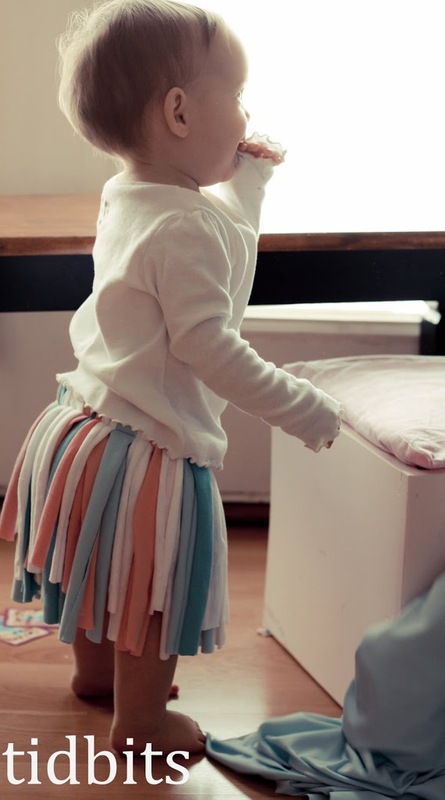 However, I opted not to do this because I wanted the knits to overlap a little on the elastic making it a fuller tutu. You could probably, at this point, just tie your strips on. But I personally think my method will save you time. Notice in the above picture how there is still some of my table showing between strips. You don’t want this. 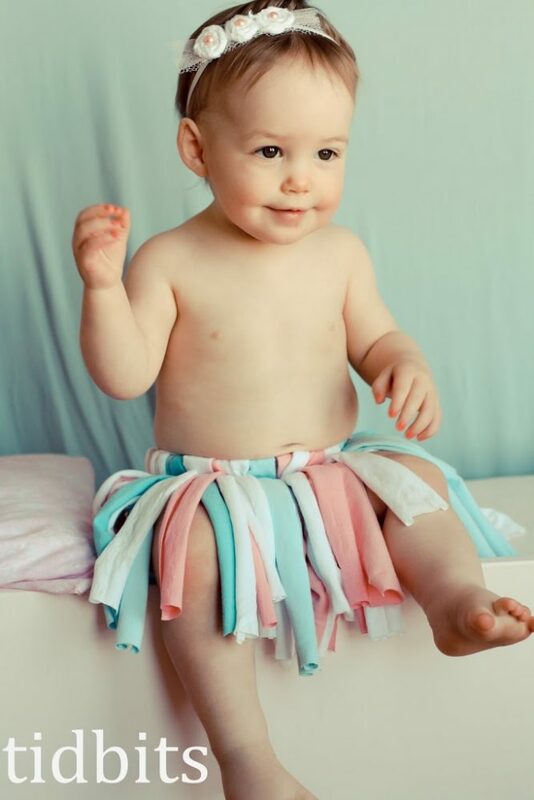 This is when I cut more white strips and stacked them on to fill it in and give the tutu enough fullness. 1. 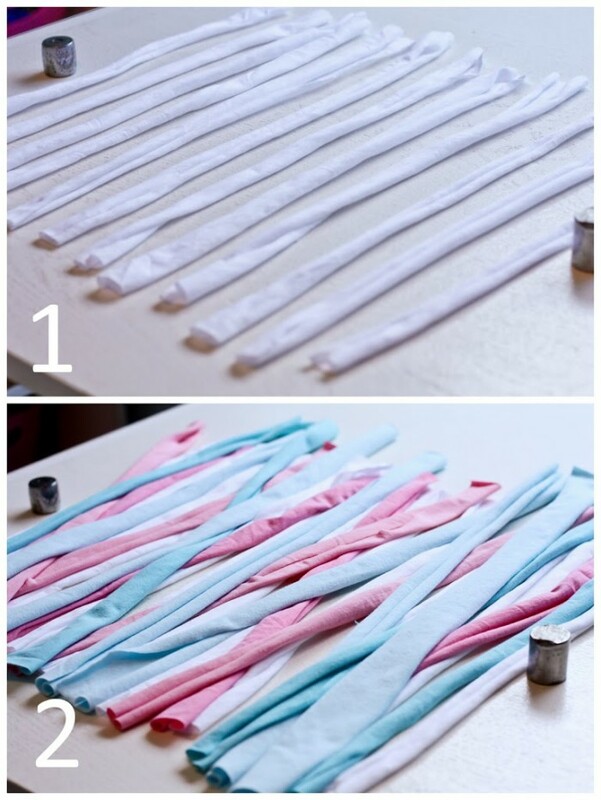 Once you have all the strips laid out how you want, place your elastic in the middle. Actually, it will need to be slightly lower than the middle so when you fold over the pieces, they are even at the bottom. 2. 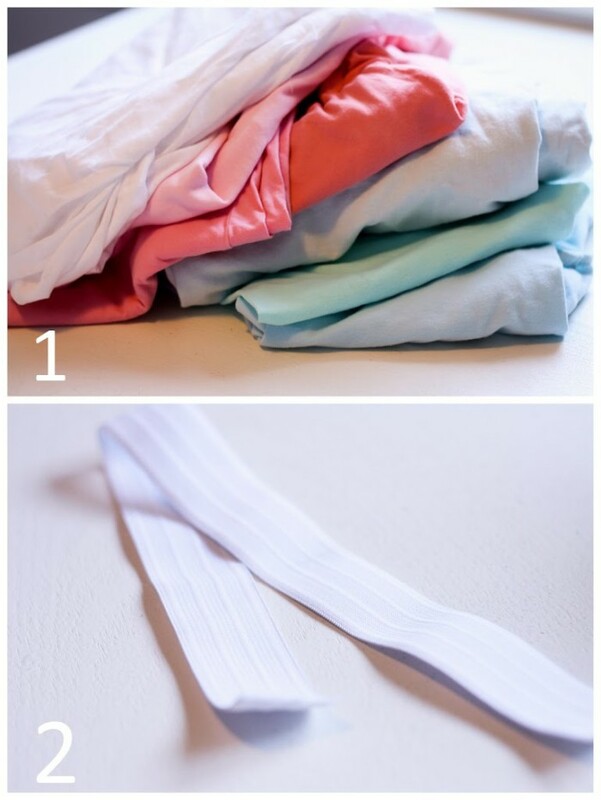 Start folding over all your strips making sure the fold is as close and as even as can be to the top of the elastic. I put my weights on the edges of the elastic at this point to keep it from moving. Once it is all folded over it will look super cute. Don’t fret about the hem not being totally even. 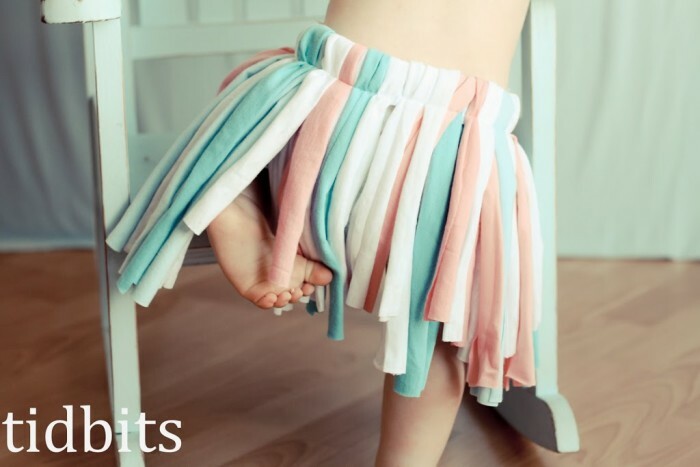 It adds character to the skirt, and there are probably worse things you should worry about. 1. Start pinning the top to the elastic. Slide your pin in at an angle so it grabs more strips. 2. 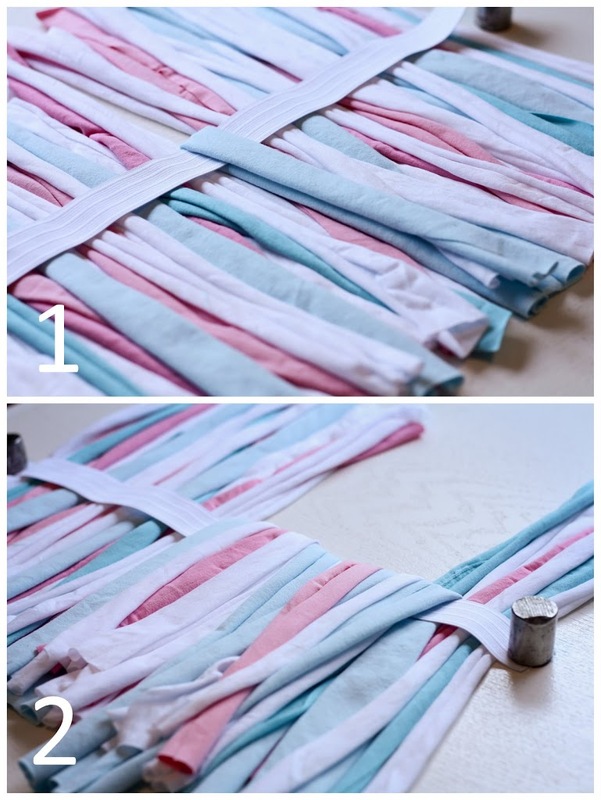 Carefully start sewing the strips onto the elastic making sure you stay even so you catch it all. Use your plate as a guide. In order to allow some give, I sewed it on using a slight zig-zag. Also, I would normally use a walking foot for knits but I wanted to prove that this could be done with a regular foot. I didn’t have any problems. It’s a bit thick so just press the layers down as they get close to the needle and it slides through great. Watch the back side of the strips as well so they are not going all crazy. 3. Leave about 1/4 inch of elastic on the ends. 4. 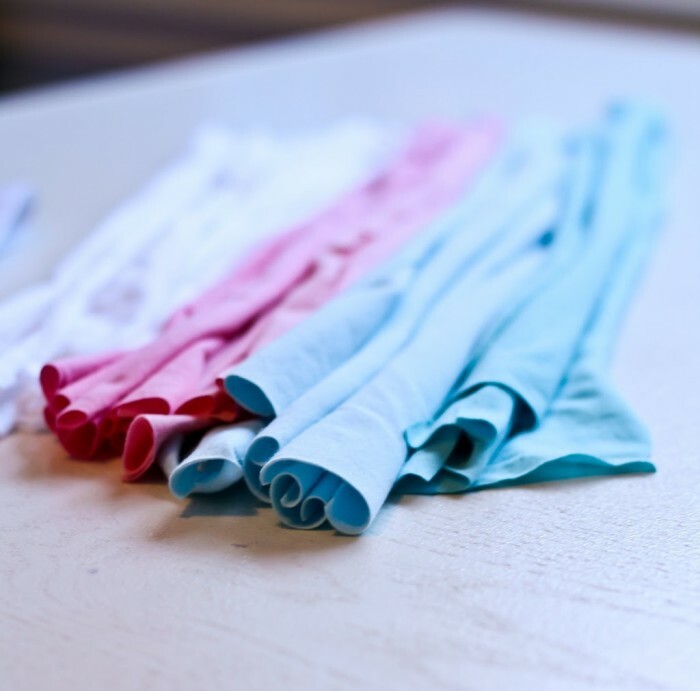 With right sides together sew your elastic ends together – back-stitch good! 1. You will have some raw edges showing. 2. Simply hide it in some strips and stitch in place. Or you could add a strip of knit over it if you couldn’t hide it good enough. Lay your finished tutu out and even out the hem. Then put it on a naked child and adore your creation – both of them. She felt pretty special wearing such a frilly thing. I loved that it was full enough to cover the poopy diaper. Actually, I probably did change her by this point. It even looks pretty cute with a shirt on. Go make one, then tell me about it! I love the t-shirt option! I teach dance and made one of my entire groups the kind with fabric strips. They were super cute since I used 9 different Christmas fabrics! I will definitely try the sewn t-shirt version! What a good idea! And it looks so much easier to sew across all those knit pieces than to knot them, the way you have to with the tulle. Nice idea! LOVE LOVE LOVE it! 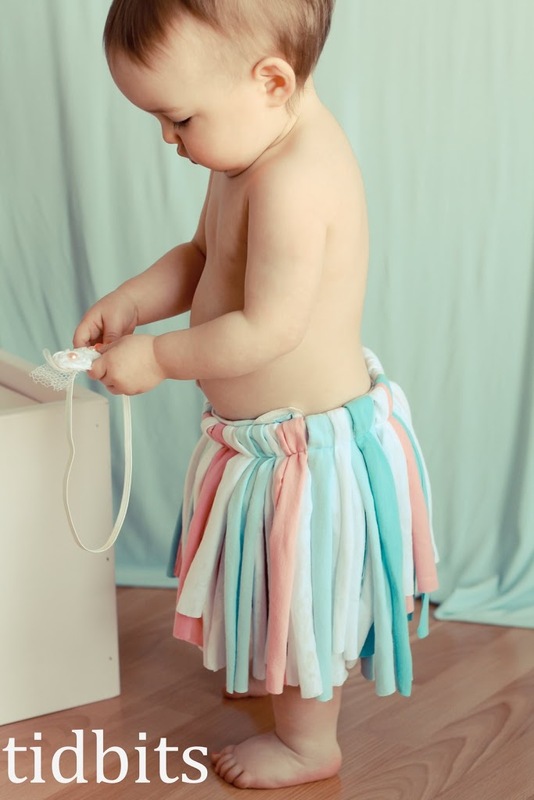 I am sure it is super comfy and not scratchy as the regular tutus. I am putting this on my list of things to make. What a great idea! I made Miss A a tulle tutu and she hates it because it&#39;s too puffy and scratchy, but this looks like a great option for her! <br /><br />PS: I received my candy canes in the mail and they are just darling!!! I tried to email you to say thank you, but gmail is giving me fits lately. So sorry for the late show of gratitude, but I LOVE them!!! This is adorable! 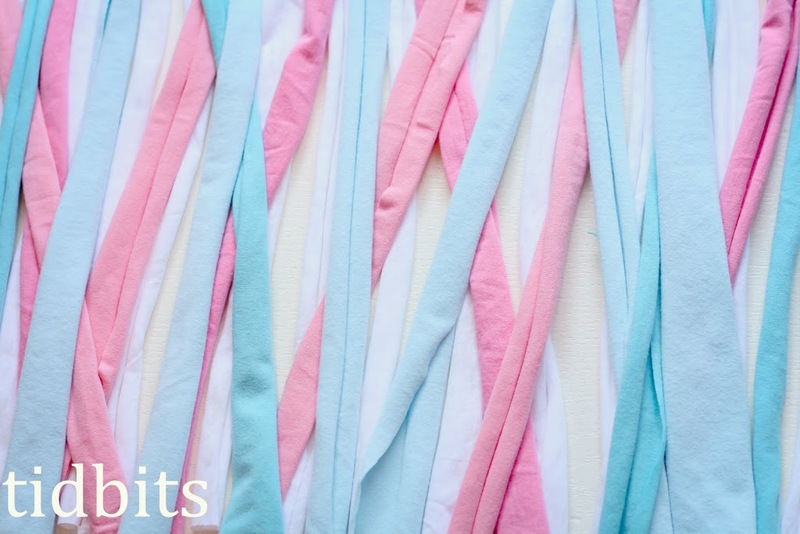 I would never have thought to use t-shirt strips but it looks great! I love the way it hangs. 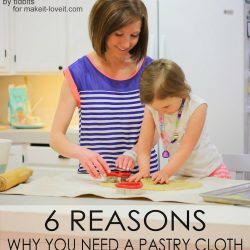 I&#39;m pinning it to my never ending board of girly crafts! Thanks! Oh I LOVE this!! 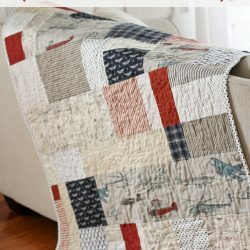 Pinning right now and will be making later. This is just beautiful! Such a great photo prop : ) This will be perfect for an upcoming shoot I plan on doing! Soooo adorable! Love it! I am totally stealing this idea. 🙂 Newest follower, btw. Great idea and your model is super cute!! Lovely little tutu for a baby girl! That is <b>super</b> cute.. 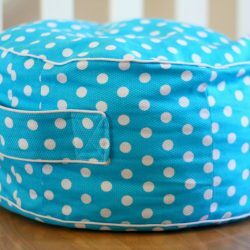 I will have to make this for my little toddler. We have lots of stashed t-shirt for projects like this. Great minds think alike I had tried this almost year ago befor I saw this post I actual did the no sew knot and felt like it wasn&#39;t full. Thanks for posting this idea I will be trying this out this weekend. Hi Nice post, Thanks for sharing a lovely experience to all.